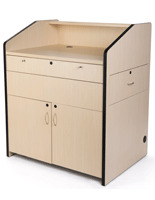 These lecterns provide a fully functional & ready to go multimedia lectern for a teacher. These lecterns can hold all of a school's AV equipment in one place. 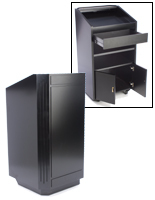 Many of our presentation lecterns provide a secure location to keep all expensive media supplies when not in use. 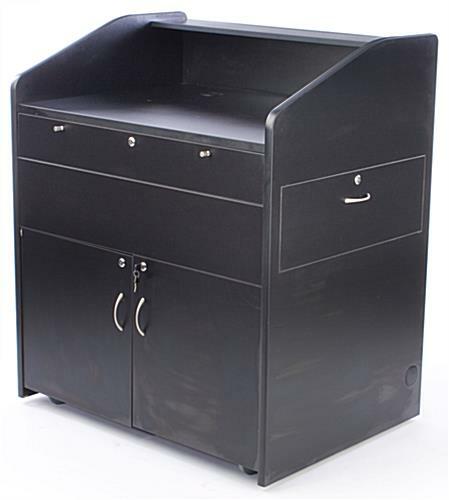 These lecterns, such as church pulpits, portable podiums, or office furniture have cable port holes throughout the unit from top to bottom and even out the sides. 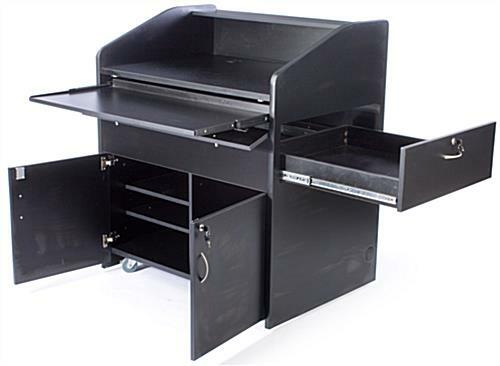 These lecterns, such as office furniture, church podiums, or public speaking pulpits have a keyboard shelf and side drawer that extend all the way out so no space is wasted by not having easy access. 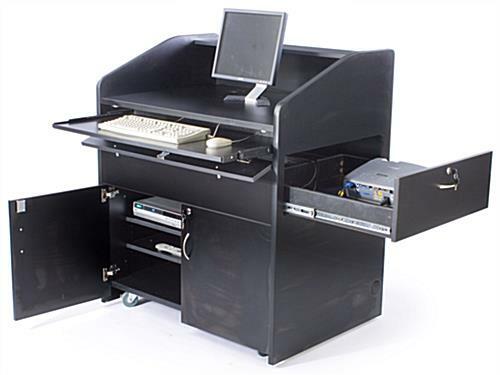 Four industrial casters on this multimedia lectern make it very easy for a single person to push it from one classroom to another. 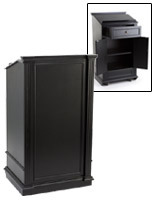 These lecterns, such as office furniture, portable church pulpits, or public speaking podiums have 2 adjustable height shelves inside the locking cabinet. 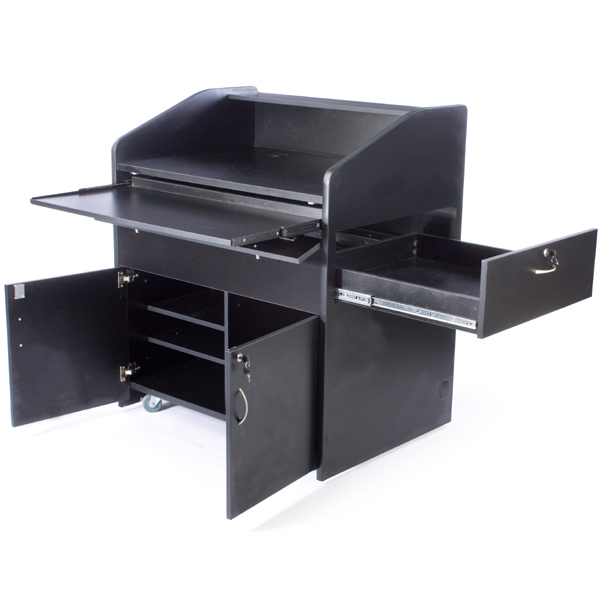 This will allow you to adjust the shelves to your desired height to fit your equipment. There are 8 adjustment heights that are 1-1/4" apart that can adjust the height from 5" to 14". 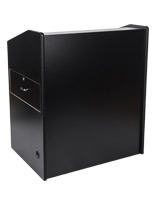 These lecterns, such as church pulpits, office furniture, or public speaking podiums are made of 1" thick laminated medium density fiberboard (MDF) which is very durable. 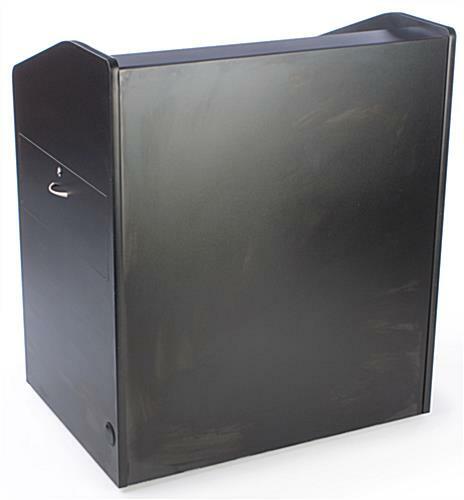 Many of our lecterns, such as public speaking podiums, or church pulpits have rubberized edges so that if the unit should happen to bump a wall while being moved, neither the multimedia lectern nor the wall should sustain any damage. 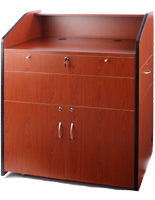 This office furniture, such as public speaking podium, or multimedia lectern can also provide confidence to a person speaking behind it. Public speaking is something students need to practice, and this large pulpit can aid in the comfort of doing so. Standing behind such a substantial lectern can provide confidence that a smaller pulpit cannot. 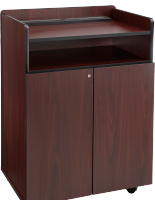 When in stock and ordered before 3PM EST, this multimedia lectern can be in use by tomorrow! 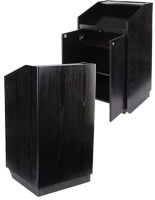 Made of 1" thick laminated MDF for a substantial lectern. 41.0" x 48.0" x 30.3"
39.0" x 18.5" x 28.0"
24.3" x 8.0" x 27.0"
The podium meets all the needs of the individuals who will be using it. It was crated very well for the delivery end of purchase. The podium came within a few days after ordering which was great. Thank you for the feedback, Fred.